Continued from previous Post: Configure Outlook for Lotus Notes. The next procedure, that we are going to look into, is applicable for both Internet as well as Intranet Emails. We have already configured Microsoft Outlook with Lotus Notes Profile for those who would like to try sending scheduled Emails from MS-Access in their Local Area Network (LAN). When we invoke the SendObject Action to send Emails with applicable parameters, the Target Addresses will be picked up from the default MS-Outlook Profile (Internet or Lotus Notes) and transmit Emails to destination. We will send the Mail Alerts on a weekly schedule and little more preparation is required for this event. We need two small tables for the Program. A Local Address Book Table to keep the Recipient's Addresses in Access. NB: It is possible to attach MS-Outlook Address Book or Lotus Notes Address Book to Microsoft Access Database. We can read the contents of this Table with Code and create the To. . . & Cc. . . Field values of the Email message. In our local address table we only need to keep the First-Name, Last-Name part (Nancy Davolio) to use as Mail ID. When the Mail is send through Lotus Notes it will find and pick the full Email Addresses using the First Name, Last Name part from its main Address Book and insert them into the Mail. Suppose the contents of the Mail attachment (the Report), should go to only certain recipients in our address book on a particular day and we don't want others to receive the Mail. To implement such type of refinement in the mail sending procedure we must find a way to filter out unwanted Addresses for the current mail. This can be achieved if some kind of personal identification information (like the employee Code), were already recorded in the main table. The employee code also must be included in the Address Book Table in a separate field (See the ECODE field in the above Address Book image). Having this information in both files we can easily link them together and pick addresses that match with the Report Source Data. Or in Program we can search for the employee code in the address table using the Report Source data Value and pick the email addresses. This way we can ensure that the mails with report attachment goes to the correct recipients and prevented others from getting the mail. But, here we will try the simple method. Your Application may be shared by several users but it is not necessary to configure all the PCs for sending emails. Even if they all are, we don't want our mails to go from different machines. When the Application is open in any of those machines the program will perform a check to identify the correct machine to send the mail. For this we will keep the Computer Name in a field to cross-check with the active Machine Name. You can look for your computer's name in one of two methods explained below. Right-Click the My Computer Desktop Icon and click on the Properties option in the displayed menu. Select the Computer Name Tab. Your Computer's name will appear at the right side of the Full computer name: label. Click on Start Menu; select Run . . . then type cmd in the Open control and click OK. The DOS command prompt will appear. Type Set and press Enter Key. This action will display a lengthy list of Environment Variable settings. Among them you will find your computer's name like COMPUTERNAME=X where X stands for your Computer's name. We can check for this value using VB Function Environ() with the parameter value COMPUTERNAME. Our Mail is scheduled to send only once in a week on a particular day, let us say every Monday. We assume that the Application will be opened for normal use every day by the User(s) and every time the Program will perform a check for the mail sending schedule. If it is Monday then the mail must go out only once on that day with the Report attachment, even if the Application is open several times on Monday. It can also happen that the user forgot to open the Application exactly on Monday or it was a holiday and the Mail schedule is by passed. In such cases whenever the user opens the Application next time, any Day, the overdue mail should go and must get prepared itself for the next mail sending schedule on next Monday. For this preparation we will keep a date in the parameter table. Let us start with the sample date Monday, November 19, 2007. With the above lines I hope our preparation story is all done and it is time to go for the VB Code. Copy the Main Program given below and paste it into a Global Module of your Project and save the Module. m_Subject = "BANK GUARANTEE RENEWAL REMINDER"
msgBodyText = "Bank Guarantee Renewals Due weekly Status Report as on " _& Format(Date, "dddd, mmm dd,yyyy") & " which expires within next 15 days Cases is attached for review and " & "necessary action. " 'replace x with your Lotus Notes password retaining the ~ character at end. DoCmd.SendObject acReport, "BG_Status", "SnapshotFormat(*.snp)", m_Addto, m_Cc, "", m_Subject, msgBodyText, False, ""
'previous Monday, if the mail was send after the due date. In the above Code you must make a change in the SendKeys "xxxxxxx~", False command parameter given in quotes. You must replace the x characters with your Lotus Notes Password and retain the tilde (~) character, which is equal to the Enter Key stroke. This will send the Lotus Notes password in advance and expected to meet the Password Prompt of Lotus Notes in time, in that case the password Prompt will not pop up. Since, the mail is routed through different channels this is a blind-folded shot and can miss the target, in that case Lotus Notes will demand for the password and you have no other choice but to key in manually and press Enter. For Internet Users this can be disabled with a single quote at the left side of the command, if the SMTP in Outlook is already configured with the Email password. We will put few lines of code on the Control Screen Module to give a few seconds delay immediately after opening the Application to get set for calling the SendWeeklyMail() Program. 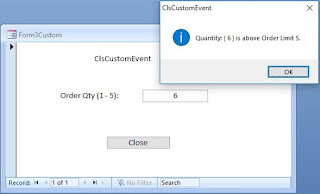 Copy and paste the above lines in the Control Screen Module save and close the Form. Try out the Automated pre-scheduled EMail Procedure. Thank you for this honest blog post. I believe it's crucial for persons to remember this when they're commenting. I actually all web site comments, and am happy to get them. But, I always respond for the ones that take the time to accomplish it correct.